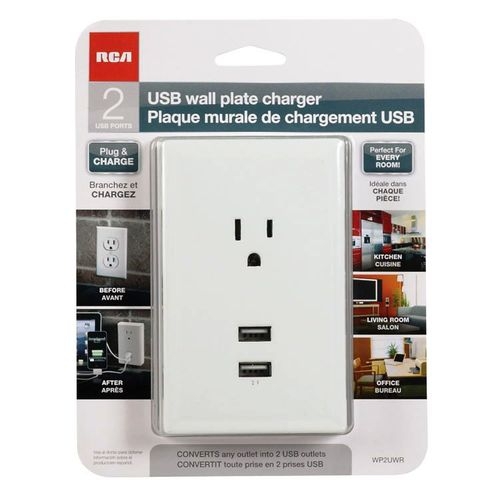 RCA's USB Wall Charger, Just Plug It In! "Most modern smartphones, tablets, MP3 players, and other gadgets rely on USB-based chargers. Some of these come with their own AC wall adapters, while others include nothing more than a USB cable-meaning you have to plug them into your computer to get them charged." The nice thing about this thing is that you just plug it into the existing outlet, so it's basically a cover. No need to replace the current outlet so you don't have to worry about shocking yourself silly. And it goes for the small sum of $15.00 USD at Lowes (currently out of stock in my area), or you can get it at Amazon.com for $12.47 USD (currently in stock with both white and almond colored versions).